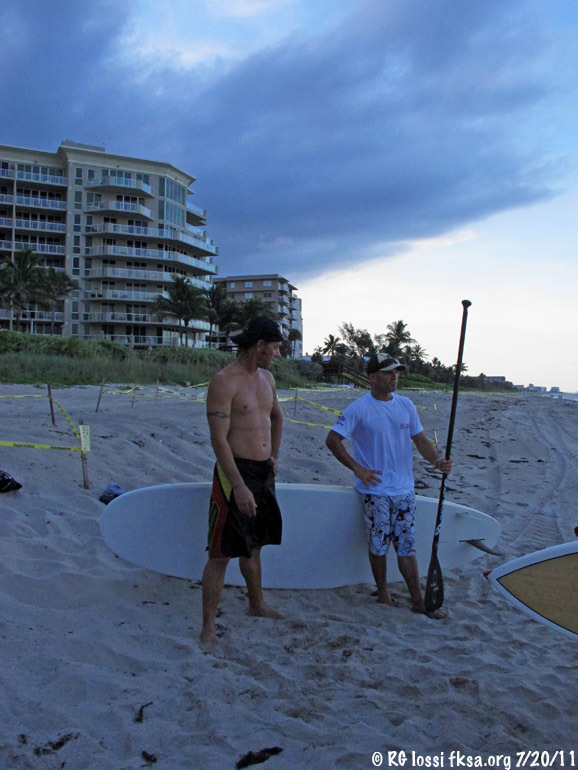 Lloyd at the Orange Bowl SUP race in Miami on January 2, 2011. 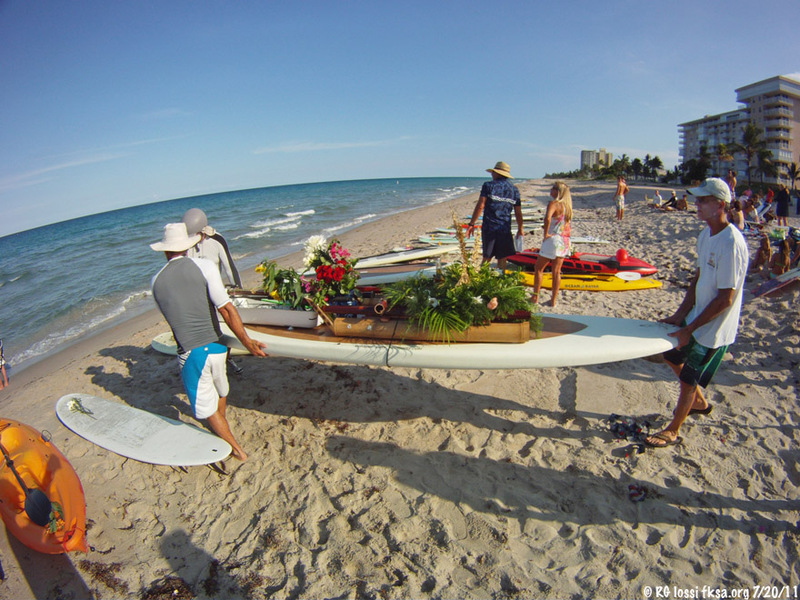 Fellow kiter, SUP'er, diver and long time friend, Lloyd Northrop III passed on Sunday from natural causes. 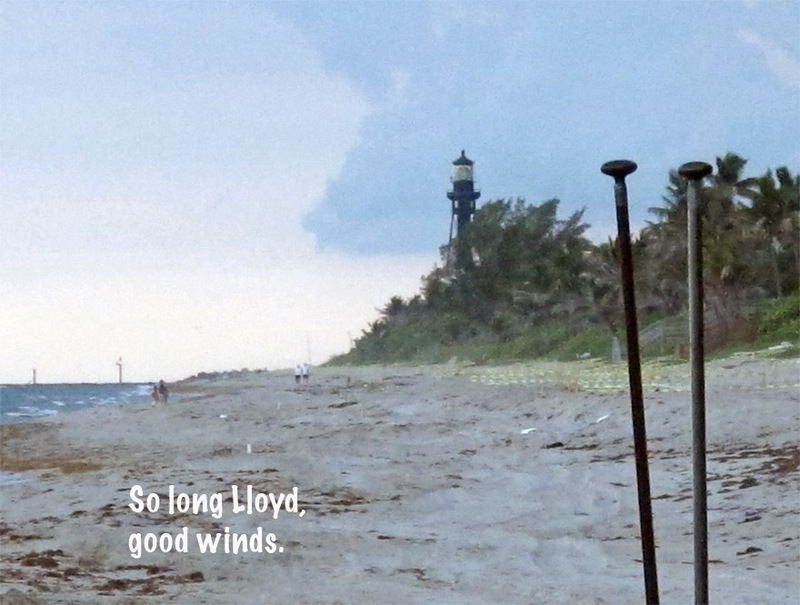 Lloyd as been an institution in Pompano kiting and access issues for many years. 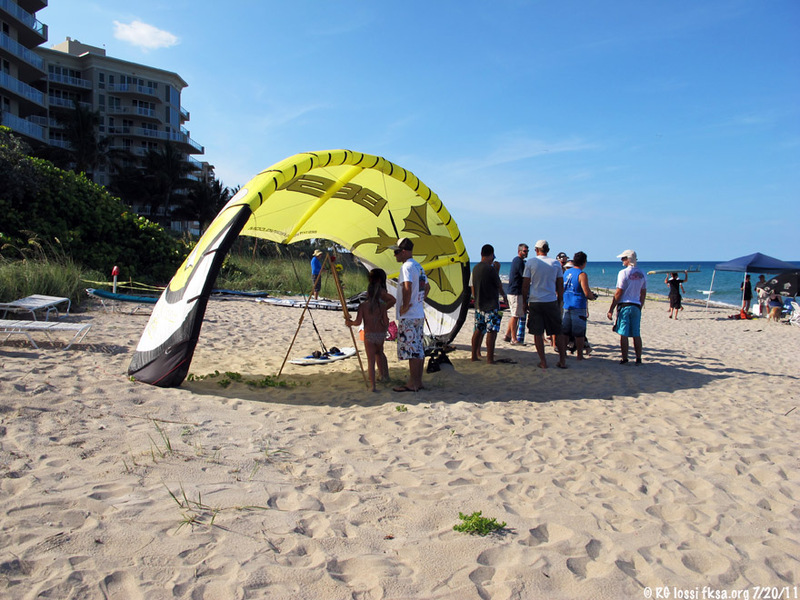 He has been a regular at the NE 16th Street launch in Pompano Beach since kiting got started here. 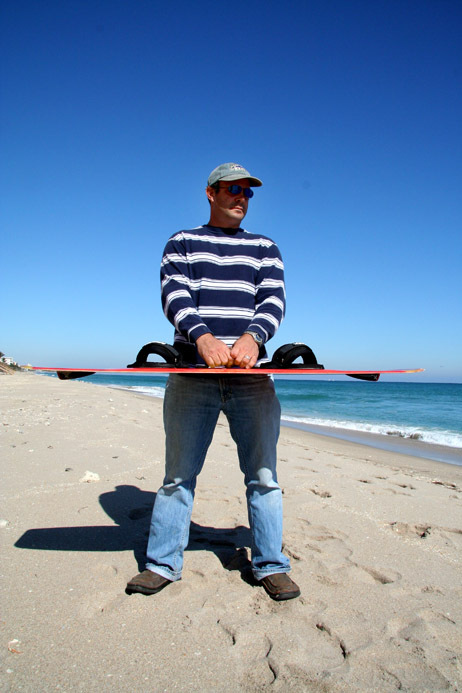 He started Waterboards seven years ago manufacturing quality, great performing kiteboards. I was fortunate enough to get one and have spent countless hours riding all over with it. 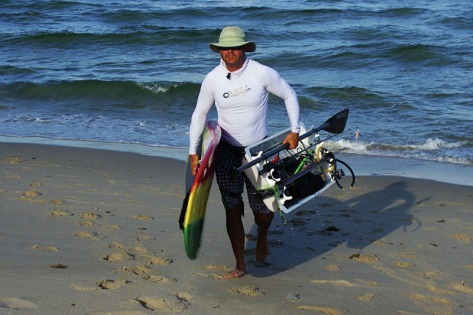 He made scale board trophies for several events including the epic Ft. Lauderdale to Bimini kite race, the Jupiter Kiteboarding Invasion and Kiteboard Masters. 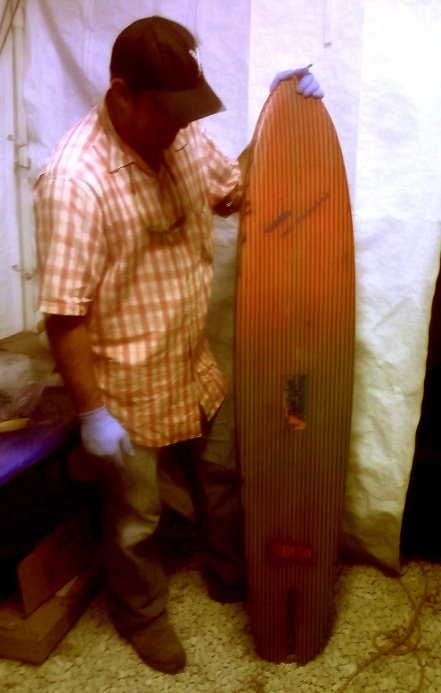 Lloyd fabricated a board as prize for the Velocity Games. Shannon Best who won it, gave it to me, it bears the signatures of all the competitors at the event. 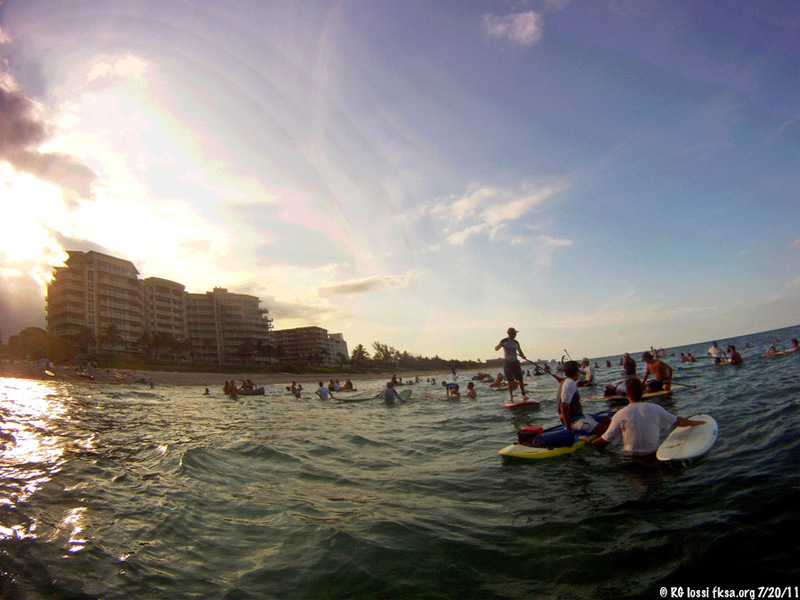 He created means for us not only to have fun on the water but commemorating these great times in a unique way. 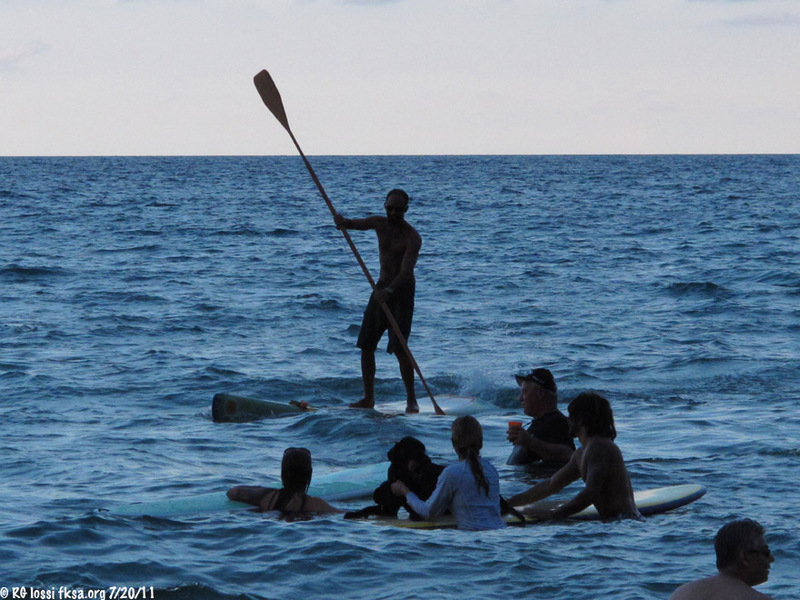 There is to be a paddleout service for Lloyd tomorrow off Hillsboro Mile. See below for more details. 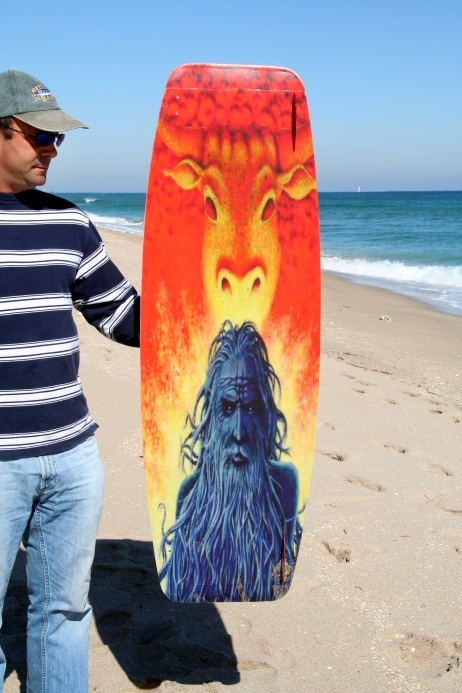 Lloyd poses with one of his boards on Hillsboro Beach. Here is an article I wrote about Waterboards in 2006. 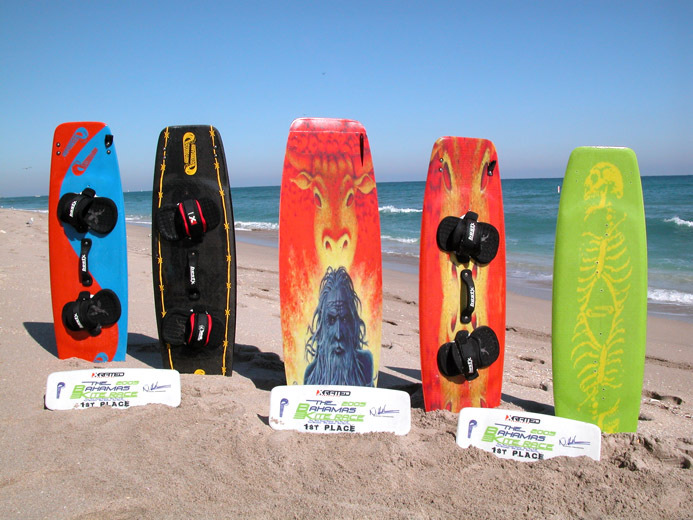 Waterboards, bringing new performance to kiteboarding. 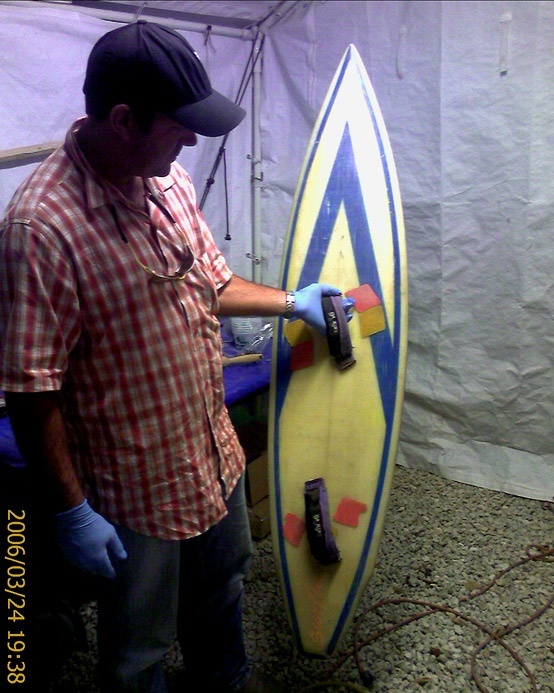 Lloyd poses with his board design. 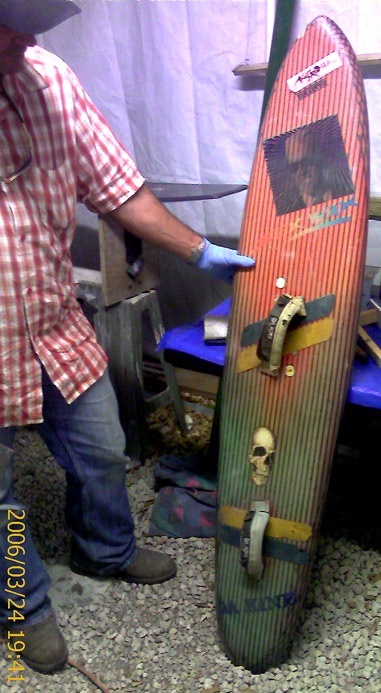 Waterboards has had only one broken board in the last 50, despite the light appearence of the design. 1. Landings are softer with the cushioning effect of the flip tips. 2. 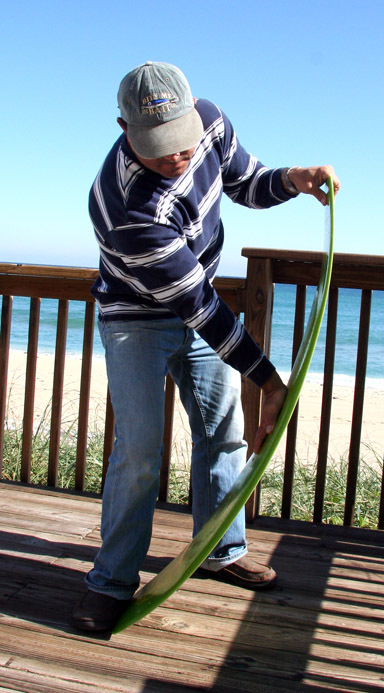 Edging requires less exertion against a building gust. 3. 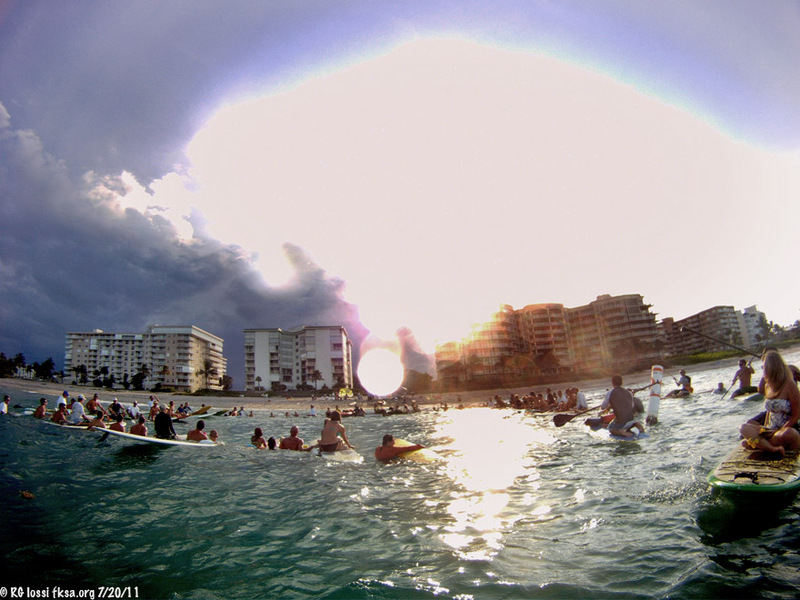 It is easier to land hot on the water. 4. A reduced tendency to skip or judder on marginal impacts or when fairly overpowered as compared to a normal rigid board. 5. 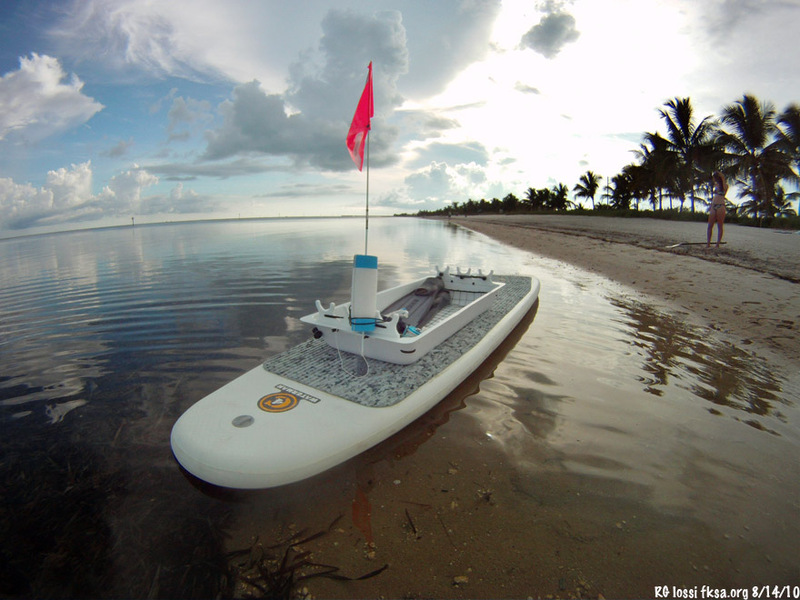 It rides well to windward. I would like to spend more time on the boards in varied conditions to better develop these impressions. What have other folks experienced out there with Waterboards? Waterboards can incorporate some pretty intriguing graphics. Pending hearing about that, here's a blast from the past. 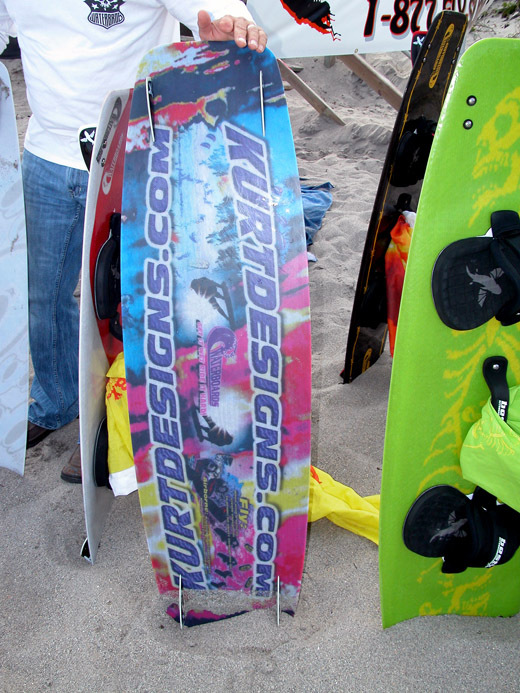 This is a 25 year old fiberglass wakeboard fabricated by Lloyd well before the thin twintip design so popular today. then went heavily into construction for quite a while. Guess what? Lloyd's back! 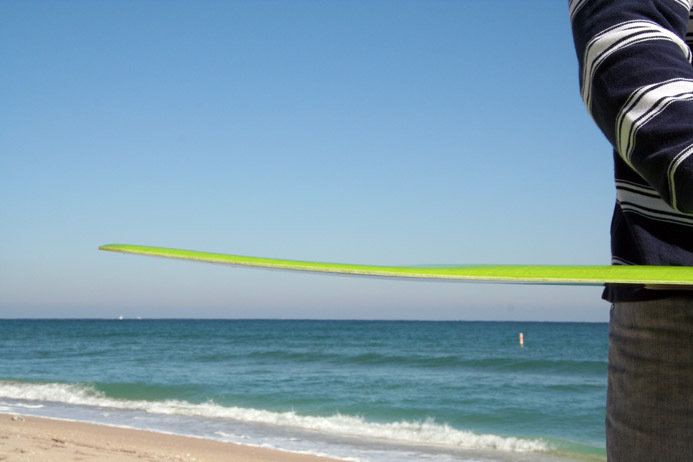 jump into the sport in 2001 with a 23 m inflatable as a starter kite? been working up some pretty interesting (bizarre) graphics too. and better carving. They come out of the vacuum apparatus at about 4 to 5 lbs. in weight. 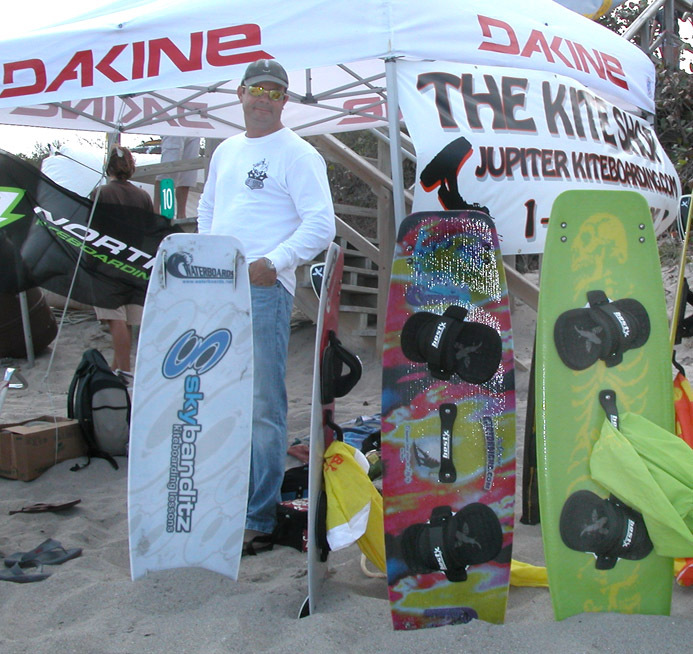 also donated a board to the recent Kiteforum contest. can hear from these three guys in posts to this thread with their impressions about Waterboards. 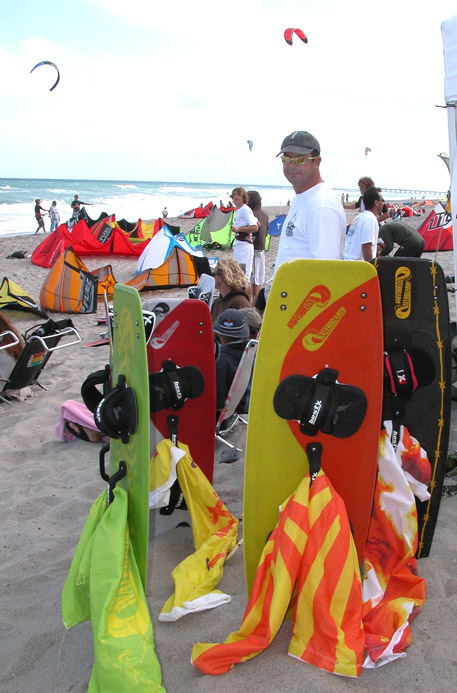 Waterboards visits the Jupiter Kiteboarding Invasion. (and on the board bag provided). 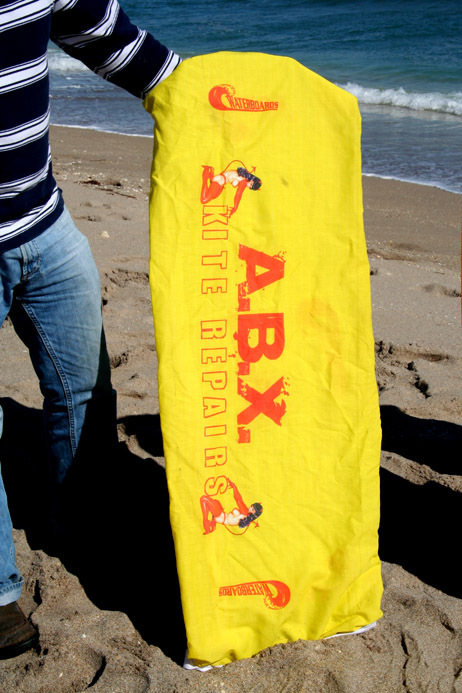 An example of a board bag. 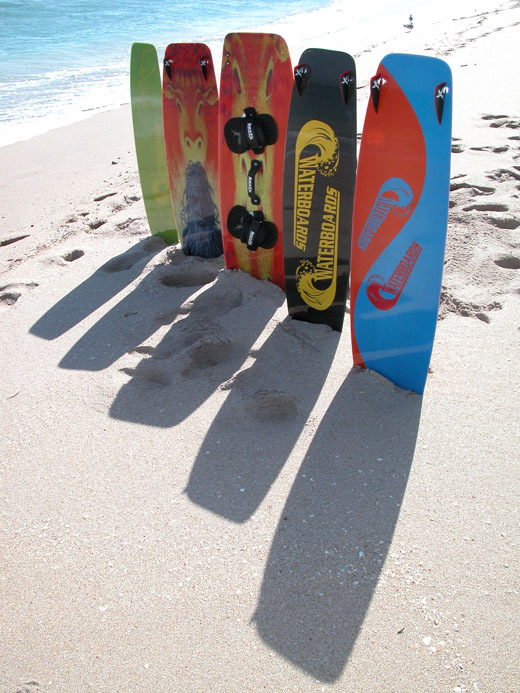 boards for wave riding and downwinders. He is also working on a full concave board for faster riding. Sounds real interesting, looking forward to seeing what he comes up with. in effect a custom board boutique complete with unique graphics. 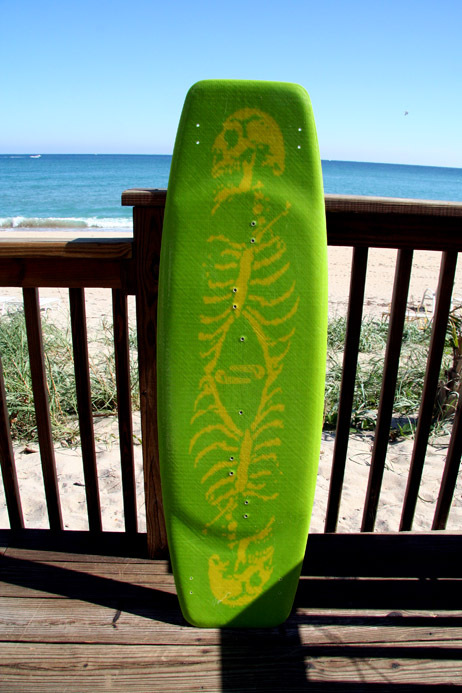 and will receive 10% off for any board they sell. and ... for something a little different. as I usually shoot riders on the water, fish & reef and snow, in no particularly order (or at the same time). She said she liked surfing. So, I handed her a board and said "hold this." 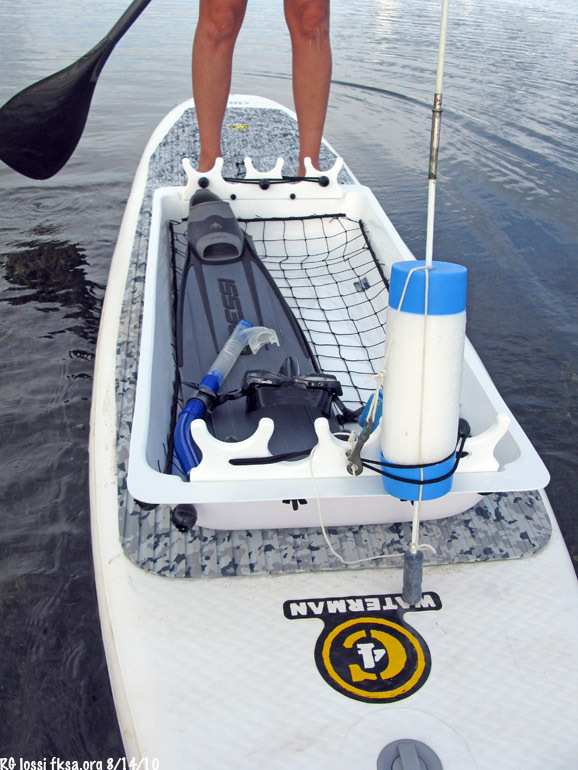 Nice, handy to have on board for those offshore SUP sessions! 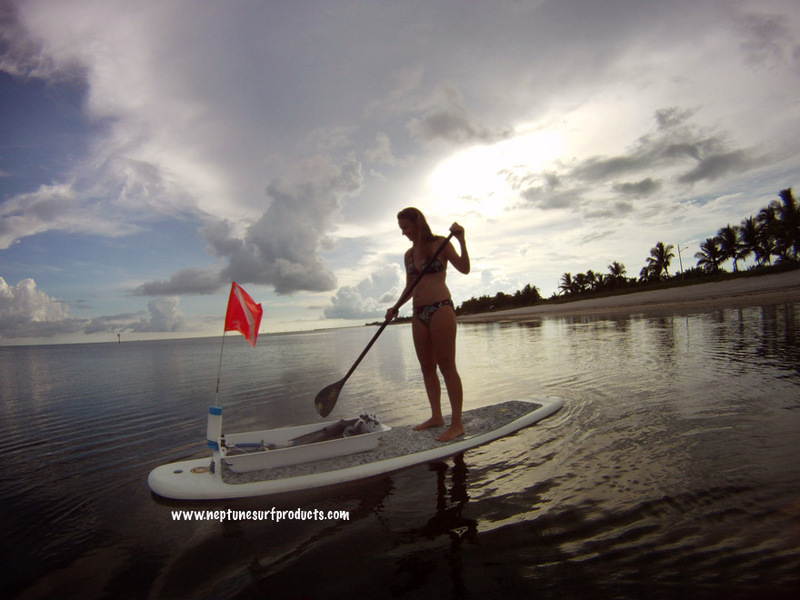 It is designed to readily attach to your SUP deck using adhesive tabs and can be easily removed after. 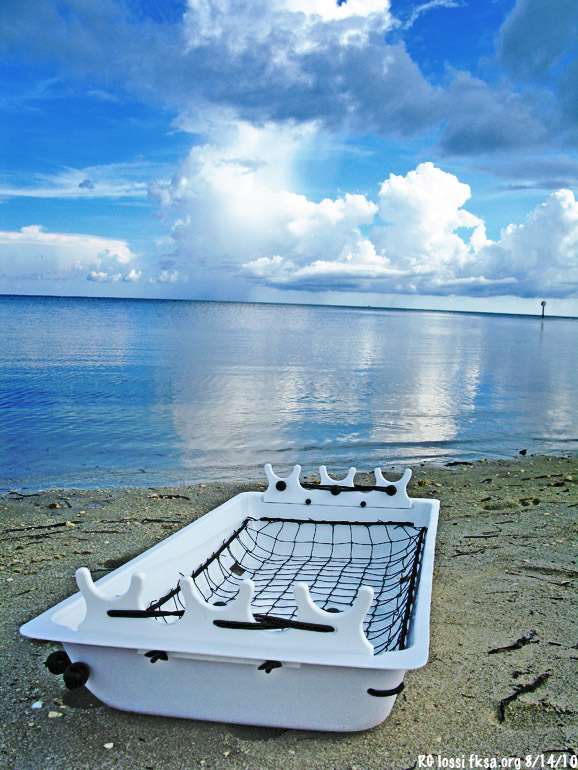 You can quickly mount your dive flag to the tray and keep your gear in it to as you paddle out to your diving or fishing spots. 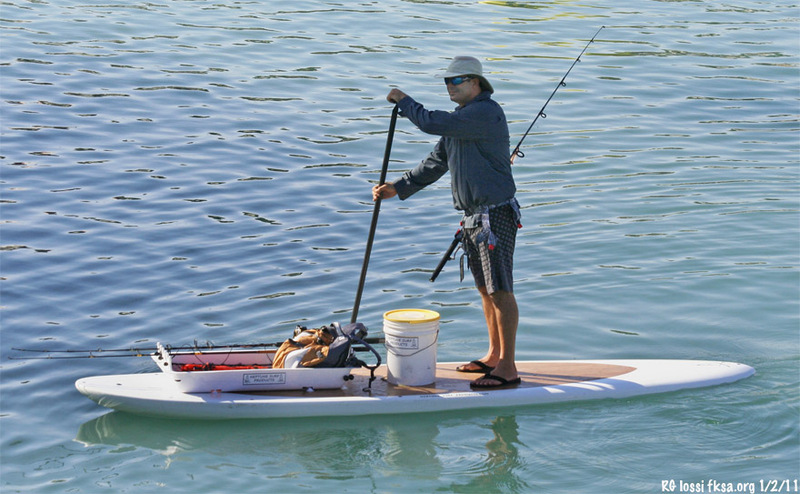 Lloyd Northrop III creator on the Sup-er Tray carries his gear up from the water. 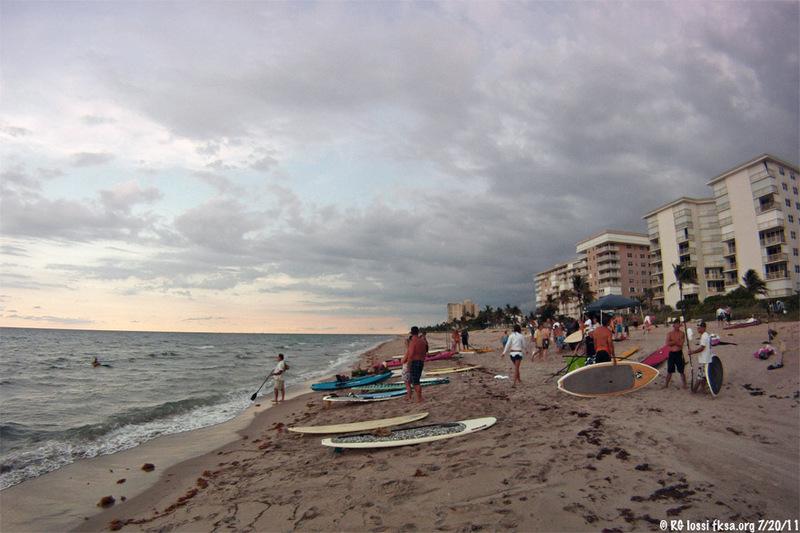 Hillsboro Beach, FL. 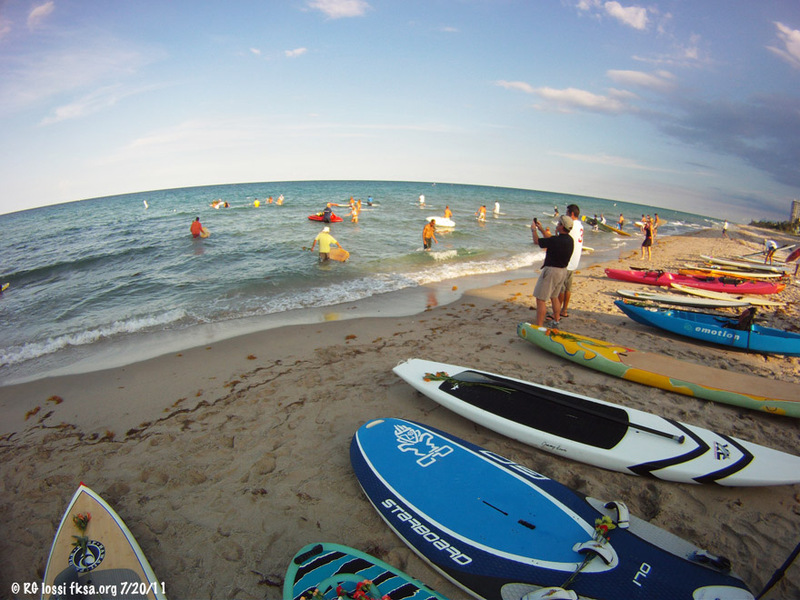 Bring your paddleboard,surfboard,kiteboar​d or your boggie board. Please pass it on. for your life and times and now poorer with your passing. Rest in peace. 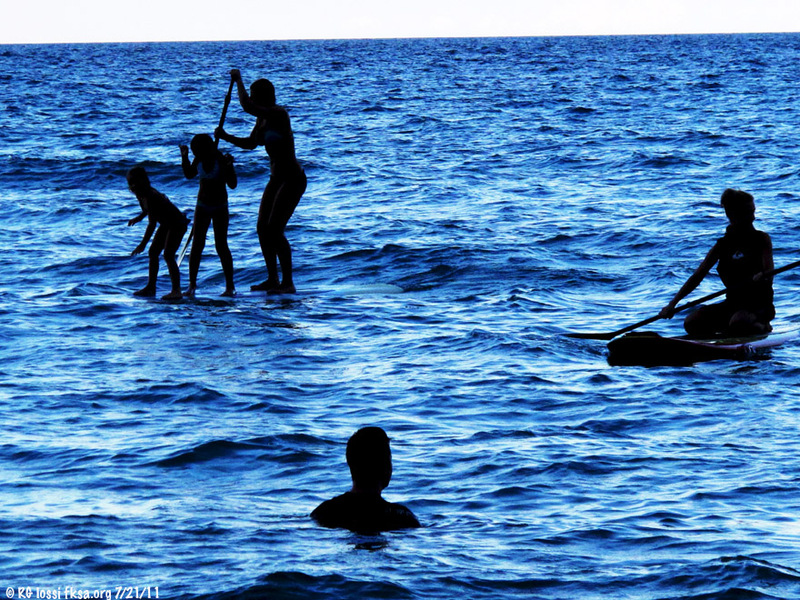 Last edited by RickI; 07-21-2011 at 08:03 AM. Wonderful write-up, Rick! Lloyd was a big personality who will leave a large hole in the community. 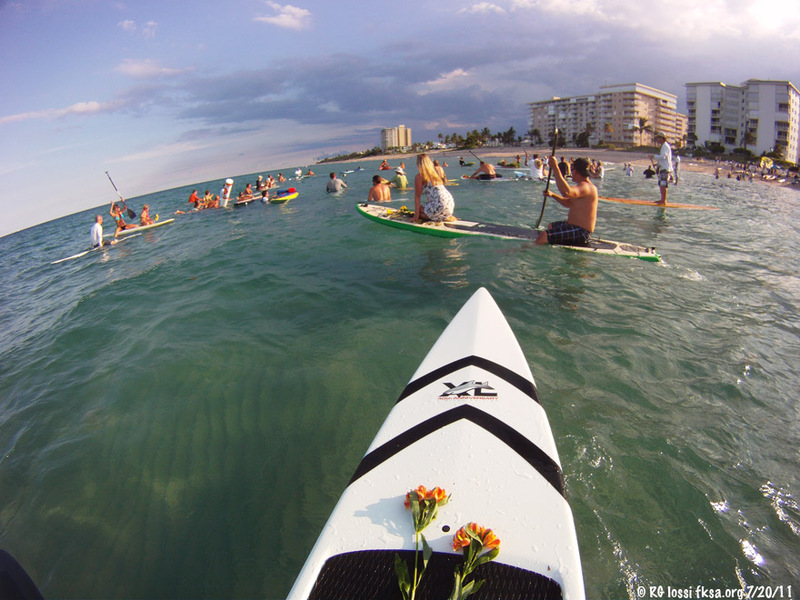 We also have information about the paddleout and service over at SF Windsports and people can leave remembrances as well in the comments. I believe my brother Dave is trying to coordinate some of the information. I'm going to post a link to your warm write up here as well. Thanks Lee, it will be difficult to not expect to run into Lloyd on a downwinder or an event or at the next response to challenges to kite access. He has been a regular participant in so many things for so many years. 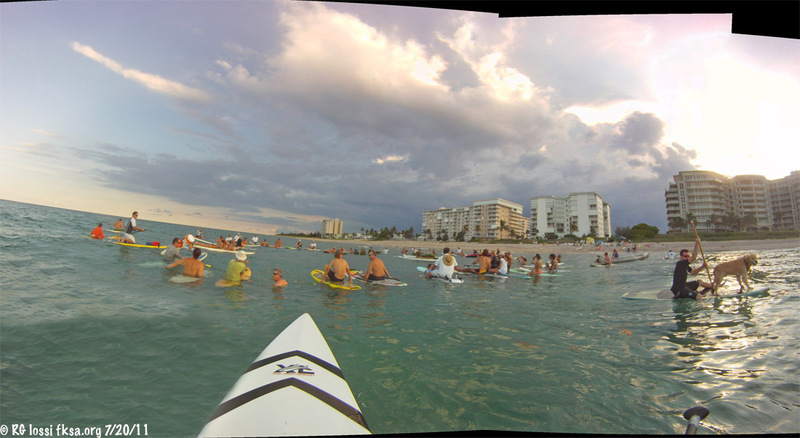 We had a memorial paddle out for Lloyd yesterday off his mother's condominium on Hillsboro Mile north of the lighthouse. There was a great turnout, perhaps approaching 125 people. Lloyd was well liked and respected in the waterman community. 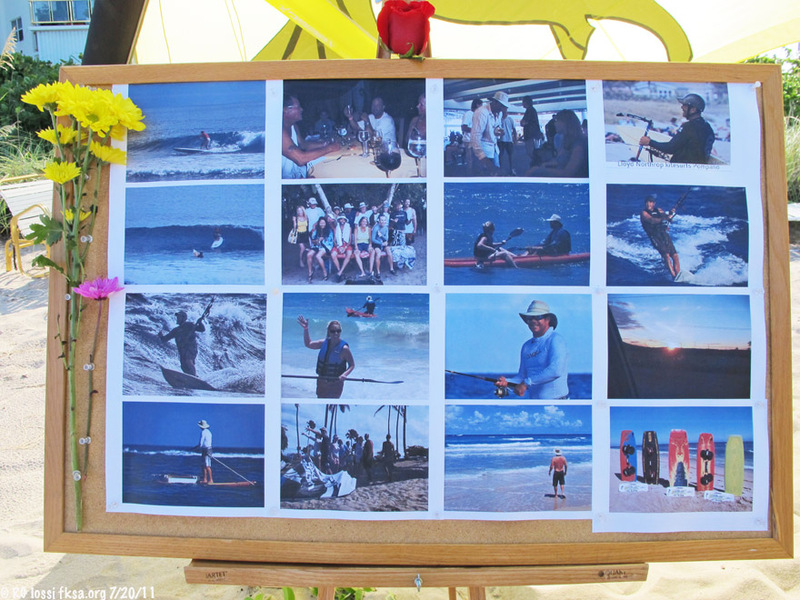 A memorial was setup on the sand under a kite with a few shots of Lloyd and friends doing what they love on the ocean. A good crowd was there already by 5:30 pm and building. 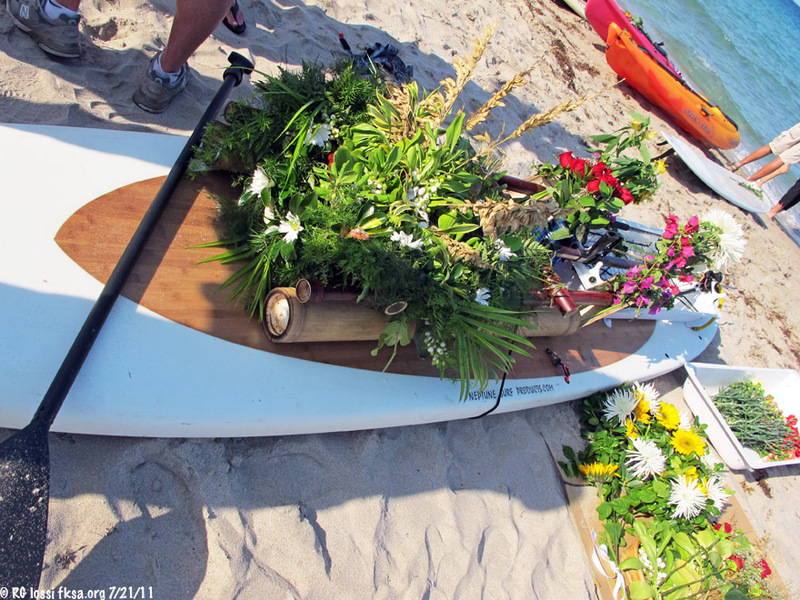 An arrangement in his memory, complete with a beer, to be floated out on one of Lloyd's own SUP boards that he fabricated. ... and the rest of us follow. There is Charlie Mishner standing on the beach who worked with Lloyd for many years in construction. 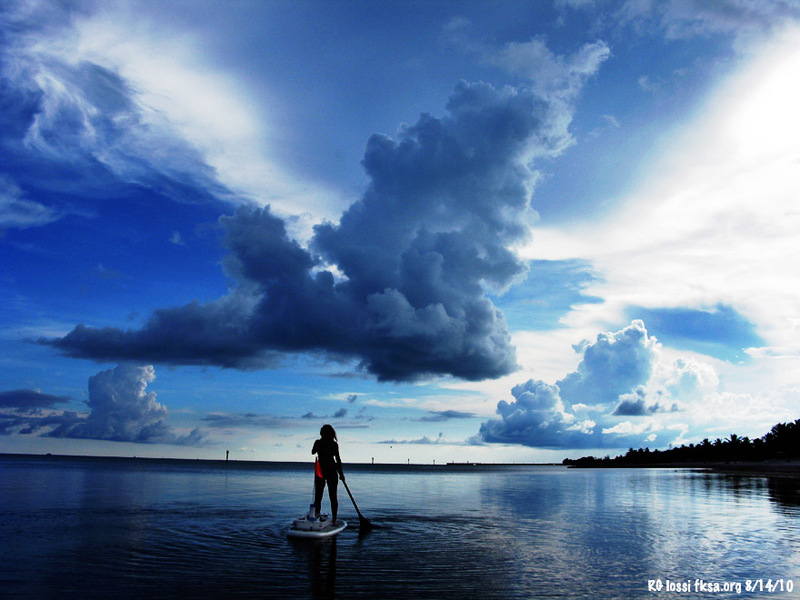 I borrowed my wife's raceboard to paddle out. Conditions were great with just a bit of weather starting to reach out to the coast from the Everglades in the form of a thermal squall. A good turnout, words were spoken about Lloyd by his friends. 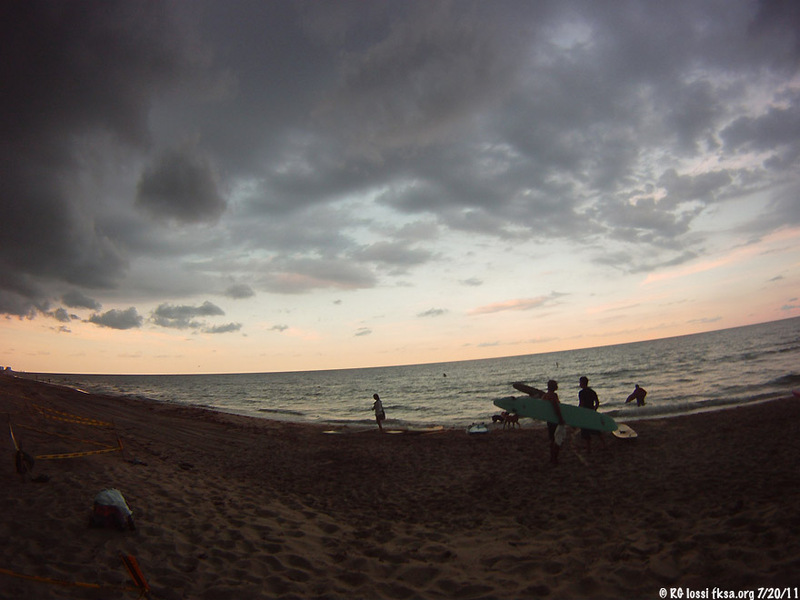 A kiter even rides out in Lloyd's memory on the light thermals pushed seaward by the squall line. Poetic but the timing isn't so good considering the threatening storm. Sometimes the squalls bring hazardous violent winds and at other times just direction changes and calm as in this case. 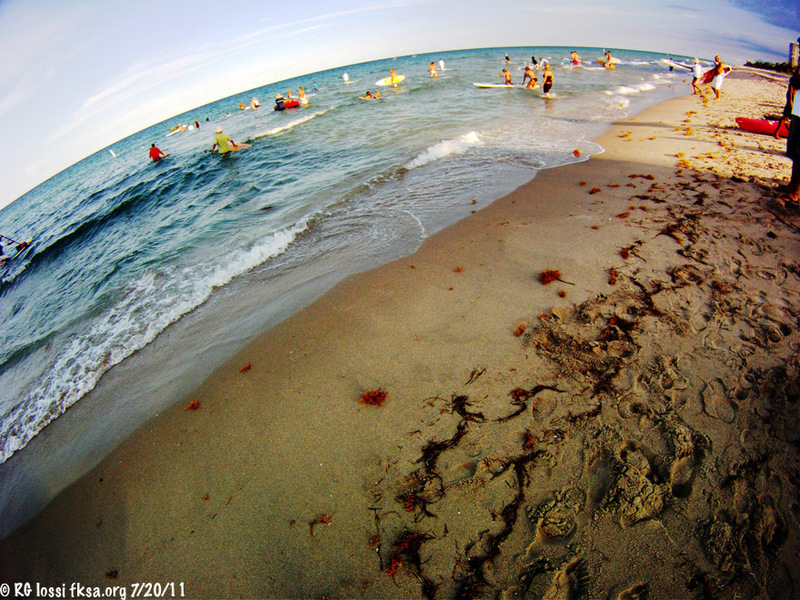 The wind shifted offshore around 7:15 pm. You can just make out the kiter way offshore attempting to tack in against a offshore breeze and perhaps trying to sail north out of path of the squall. 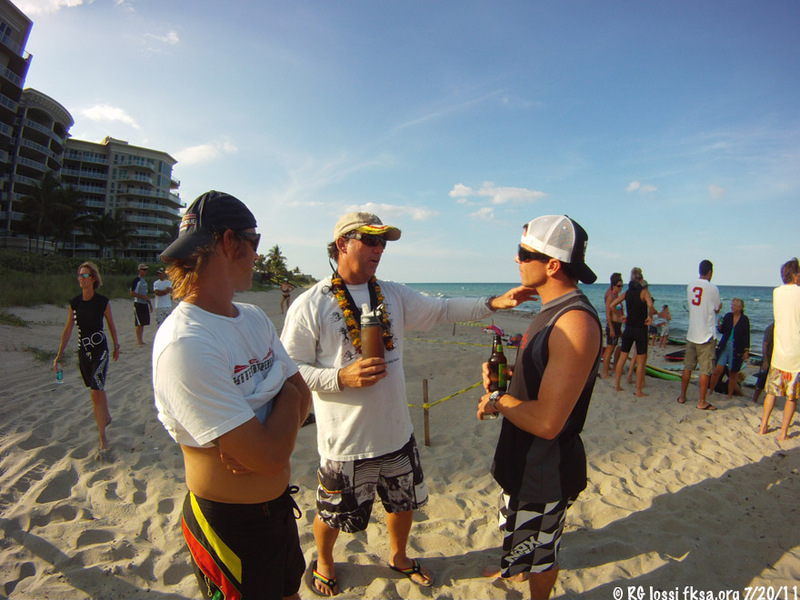 Craig was talking about paddling out to bring the guy in against the breeze blowing the fellow offshore. Things worked out this time, Lloyd must have been looking out for the guy? Packing things up, heading home thinking about friends and life. Lloyd had moved and influenced so many people, I know there were others who would liked to have attended but were unable to make the service. 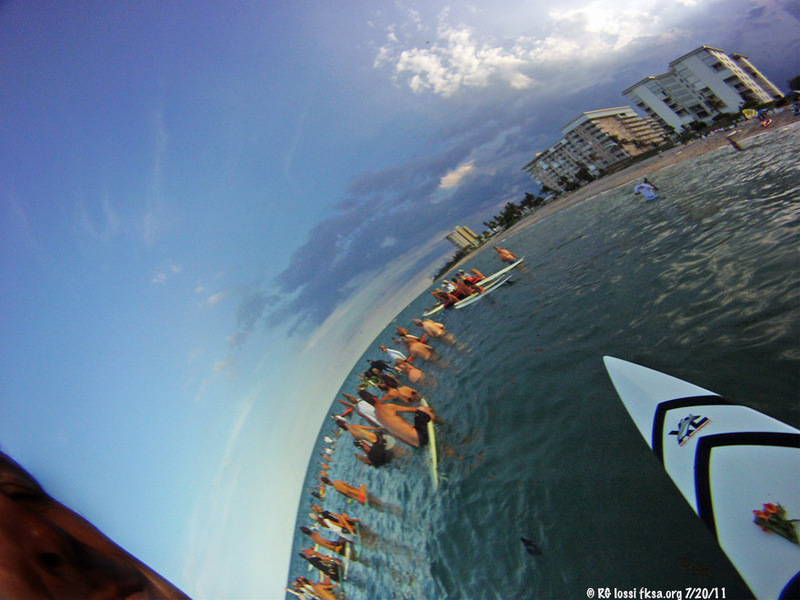 So, next time you're on the water or under it, think about Lloyd and do a session in his memory. I think he would like that. 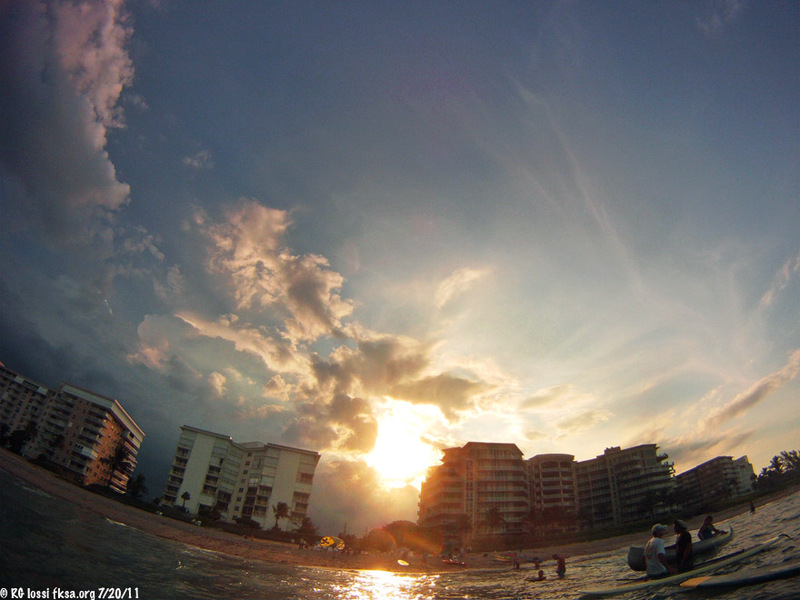 Last edited by RickI; 07-22-2011 at 08:04 AM. it will not be the same!! I am a friend of Lloyd's and Kristin who lives near the Chicago area. First I must extended my condolences to his family and all his friends. 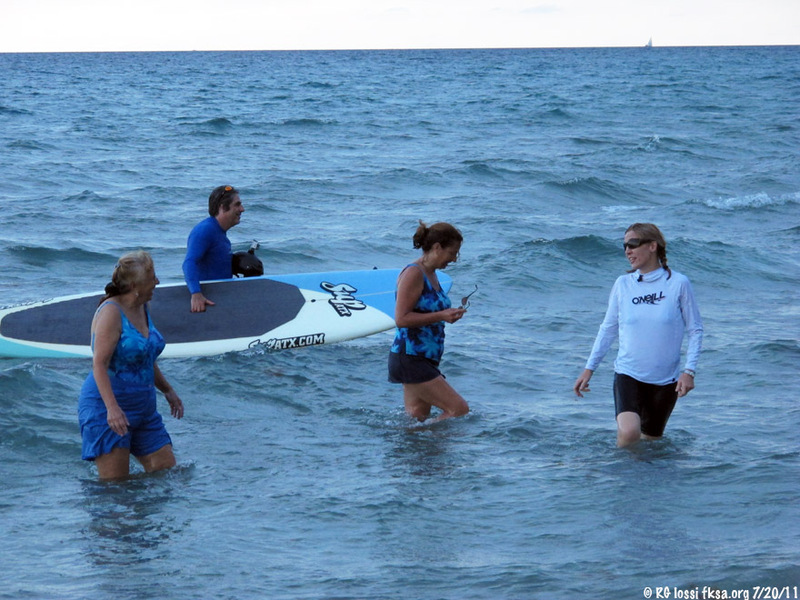 Thankfully I was I fortunate enough to have met and shared waves with Lloyd. Whenever I wanted to discuss anything related to water he was the first person I called regardless of the discipline. 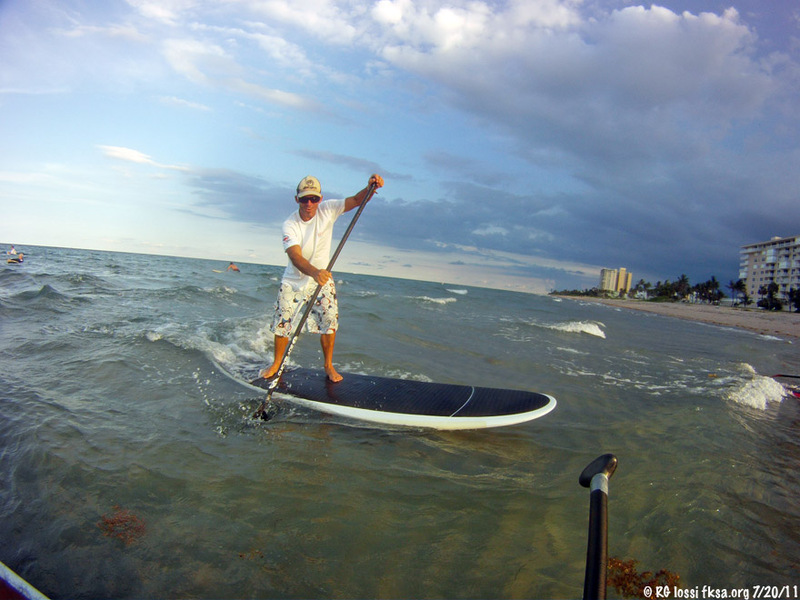 He was a true "Waterman" in every sense of the word. 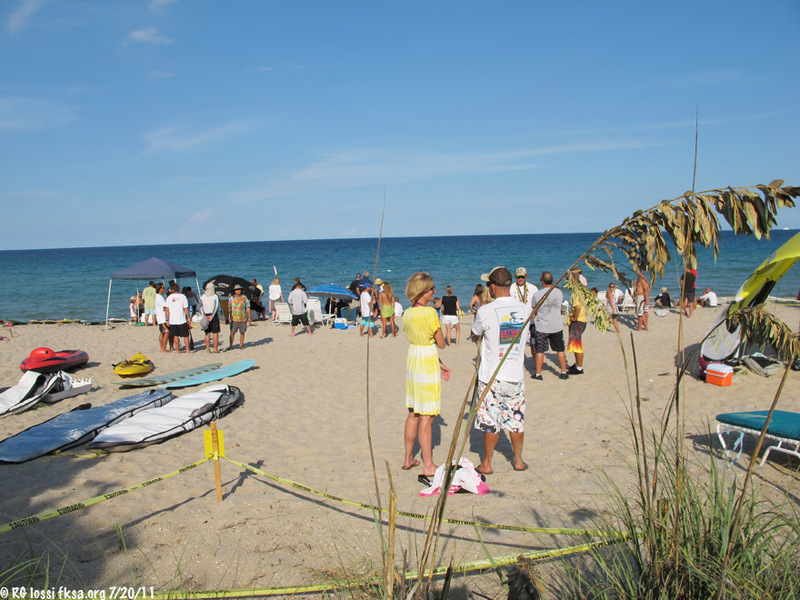 One last thought, Lloyd always spoke very highly of the kite/surf/water community in FL. He loved the people, scene and overall positive mana. Everyone meant everything to Lloyd, he always wanted to share his stoke with others! Sorry for the technical difficulties with posting pics. Hope to get them posted soon. I can't seem to post pictures due to a security token. The newb having technical difficulties, sorry. Quite a few people were shooting pictures at the memorial down here and it would also be good to see what went on in Mackinac Island too Louis. I understand there will still be more in Rhode Island. Lloyd was liked and respected by so many. It was a great tribute to a great guy.